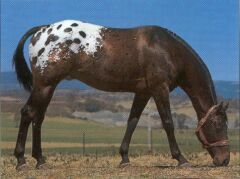 The wonderful Appaloosa horse was the result of selective breeding by the Nez Perce Indians of Idaho, Northeast Oregon, and Southeast Washington. They based the breed on Spanish stock. The word "Appaloosa" came from the Palouse River, which runs through the area. These spotted horses were mentioned in Lewis and Clark's journal from their 1806 expedition. The breed almost died out after the U.S. calvary slaughtered the Indian's horses after chasing the tribe into the Bear Paw mountains of Montana. In 1938, a group of concerned horse people in Moscow, Idaho began a registry, the Appaloosa Horse Club, to save the breed. It now has the third largest registry in the world. are also a frost coat with white specks, marble which is molted all over, and a blanket, which is all white (usually with dark spots) over the hips. Their hooves generally have black or white stripes. There are a number of types today, as there has been some cross-breeding with the Quarter Horse. Many Appaloosas have thin manes and tails, and some believe that their eyes have an almost human look to them. The height range is from 14.3 to 15.4 hands. Appaloosas are known for their quiet temperment. They are versatile, able jumpers, and do well in Western events and three day eventing. They make good trail and long distance riders. Read the next horse breeds article on Arabian Horse.